Now that you learned all about all the prep that went into enrolling and preparing for school, surely you are excited to hear how the actual school day went! As promised here are the first impressions of school. School started on a Monday, and they invited only the new kids (and their parents) to come for a half day. This was a combination of “Back to School” night and “Meet the Teacher”. Since it was only for the new kids, it was a really lovely way for them to get to know the school with a little less pressure. My buddy Ramiro, from the Guatape tour, picked us up promptly at 6:30 am to take us to school. We love him! 6:30 a.m, however… notsomuch. Maria is instantly attached to the girls. The girls are pleased that someone – anyone – is happy to see them. Notice the knees showing. More on that later. Zoe and I got up during the 4-7 grade group and I think I did well introducing us and trying to show that we spoke some Spanish. Then the next group was the older students, of which there were only a few, and Haley managed to avoid touching the microphone while introducing herself in very good Spanish. Win-win for Haley. After that they released us to the cafeteria for a coffee break, where we mingled ever-so-slightly with a few Colombian parents. A father at the neighboring table called to us and said “Your president said shithole”, while chuckling. Oh, good times. This was the day after the shithole incident. I muttered something like, “It’s interesting to watch American politics from outside America,” and left it at that. I think the dude was mostly amused at the word “shithole” and liked cursing in another language. Haley: “Same”. At that point, the parents were released and Haley and Zoe continued on their day of getting to know other new students and the school grounds. During that first day, a few English teachers pulled the girls aside for what appeared to be a very serious meeting. The newbie gringa girls were very concerned they had done something wrong until the teachers explained that their skirts were too short. Oh is that all? OK, no problem. So after they got home we asked some fellow expats for a tailor nearby, because the lady who made the skirts lives way on the other side of town and I did not want to trek over there, then have to go back, all in the span of 48 hours. So I got the name of a tailor within walking distance and we headed off to find him. That was successful and the girls even asked him to take in their vests to make them a bit more feminine. He laughed and said he could do it. He made a few disparaging remarks about the size of the clothing made by the first tailor. Me: “Same”. The girls had their first full day of school on Wednesday, which included all of the students, not just the new ones who went on Monday. The first thing you have to understand is the Once Girls. This is not pronounced as you probably read it, but instead is “11” in Spanish: “OWN-say”. 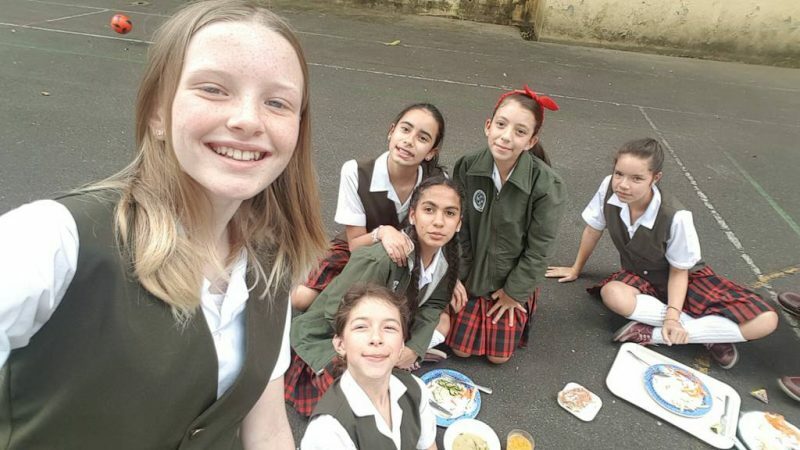 The Once Girls are the Seniors (11th grade is the top of the heap in Colombian schools) and they are a combination of Mean Girls, Pink Ladies and Toddlers and Tiaras. You need to know your 70’s and pop culture to get all those references. On the first day, as the rest of the students were being greeted in the gym, the Once Girls arrived on a party bus, and proceeded to lead the entire school in a loud, bass-filled, hip-gyrating dance party. These girls clearly had planned this ahead of time. Unlike the rest of the school, these girls are allowed to wear makeup (and Haley says they take full advantage of this privilege) and they have matching jackets, which they designed last year. 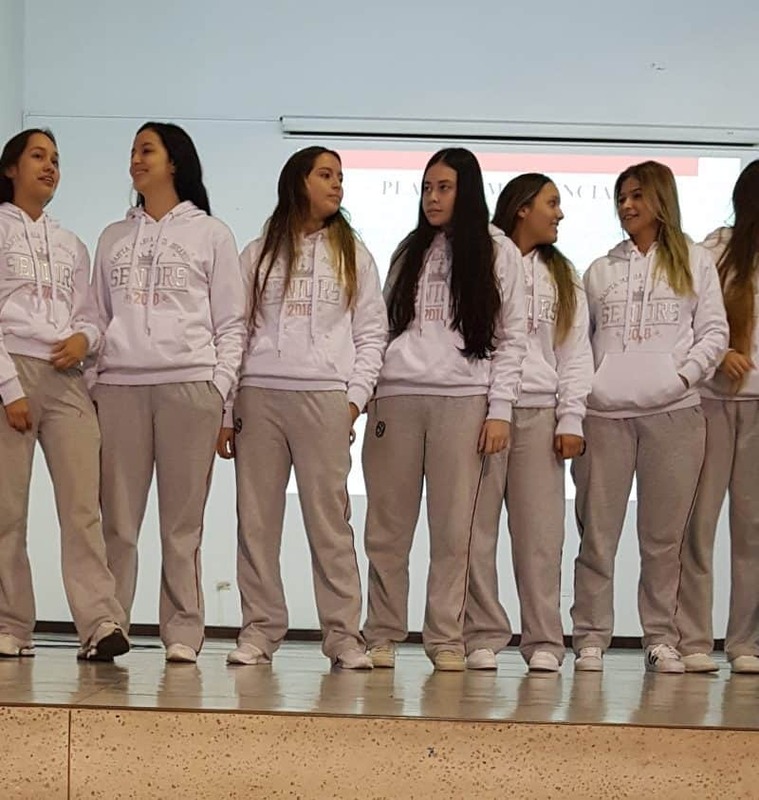 After the synchronized dancing and basking in adoration and admiration of the rest of the school, the Once Girls presented their special jacket to the Directora. 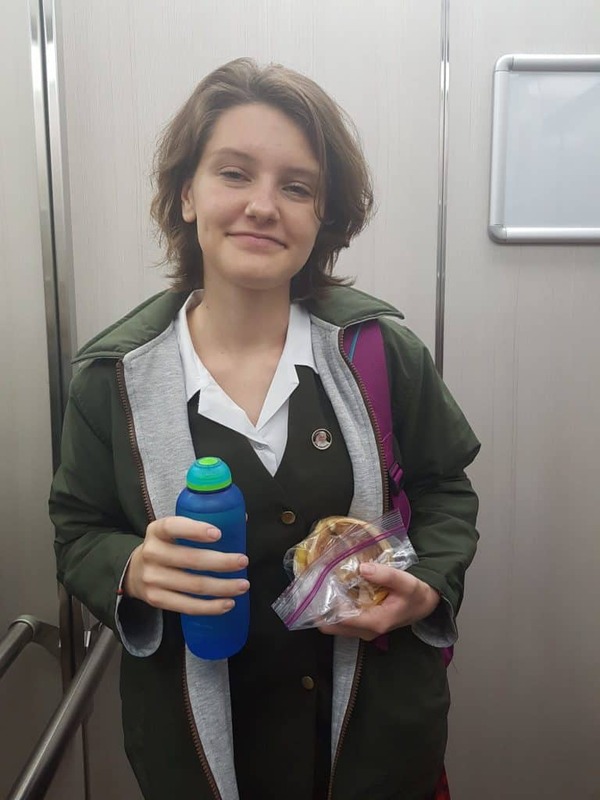 This jacket is a big deal: Haley says her class (grade 10) is already talking too much about the jackets that they will design in preparation for being in Once Girls next year. Haley says that if she hears the word chaqueta (jacket) one more time her head will explode. Here are the Once Girls. Their jackets say “Senior” across the front. Clearly long hair is the thing. 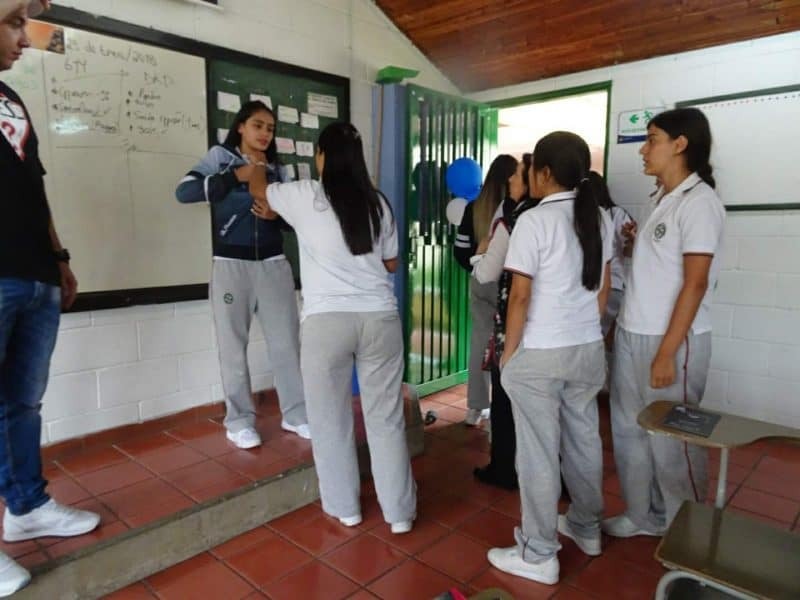 Within the first 5 days of school, the chaqueta rep shows up and the 10th graders start discussing what kind of once jackets they want. The first few days of school was a bit of a free-for-all with clothing. 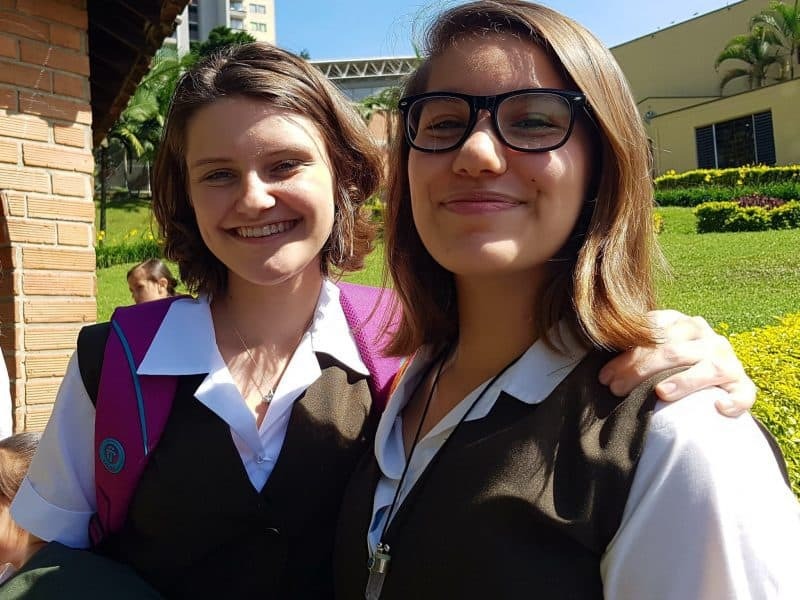 Zoe and Haley were fully decked out in the (now-properly-fitting) vests and (now-longer) skirts, but most of the other students were wearing PE uniforms. I guess whenever there is any kind of question about what to wear, everyone wears PE uniforms. By day 3 everyone’s schedule had not yet been released so no one knew when their PE days were so Haley and Zoe switched into PE uniforms too. PE uniforms are the best option when you play hide and seek with your classmates while on break. In addition, even if you’re not a new kid, turns out your skirt might be too short. On the second day the male music teacher lectured Haley’s entire class on their skirts being too short and not sitting like ladies. Apparently, a lot of girls had a sassy retort asking, “But Profe, why are you looking at us?” with all the attitude of the Pink Ladies. Throughout the first few days, the teachers came in at different times to introduce themselves. This is Zoe’s first experience with a fully-changing schedule. 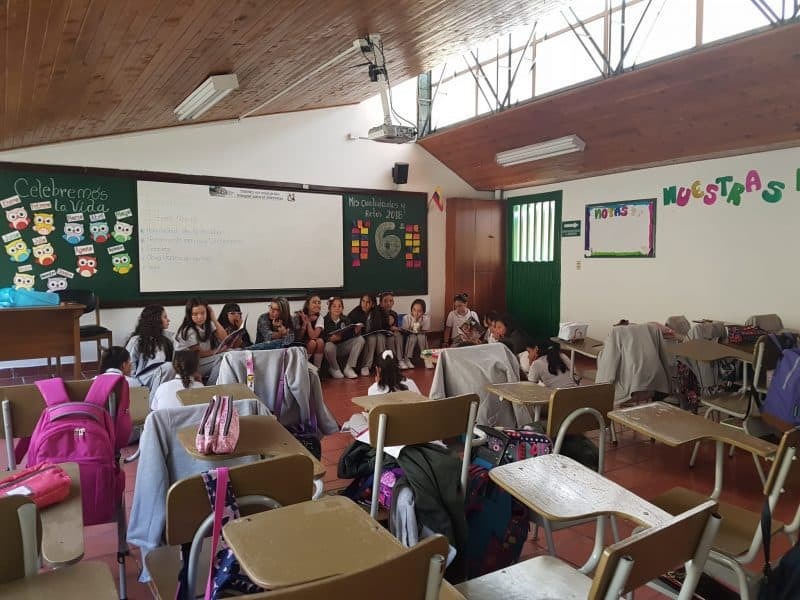 She said her homeroom teacher started off by talking about menstrual cycles and how the teachers were all available for any support they might need. Ah, the benefits of an all-girls school! The male teachers are all young and honestly, they are all super cute. Haley reports that they all dote on the older girls but not in a weird way. There’s a lot of cheek kissing and hugging and touching between teachers and students, but still not in a weird way. It’s the “latin” way! Both girls like Juan Carlos (the Christmas Elf English teacher) and Cristiano (the music teacher) the most. 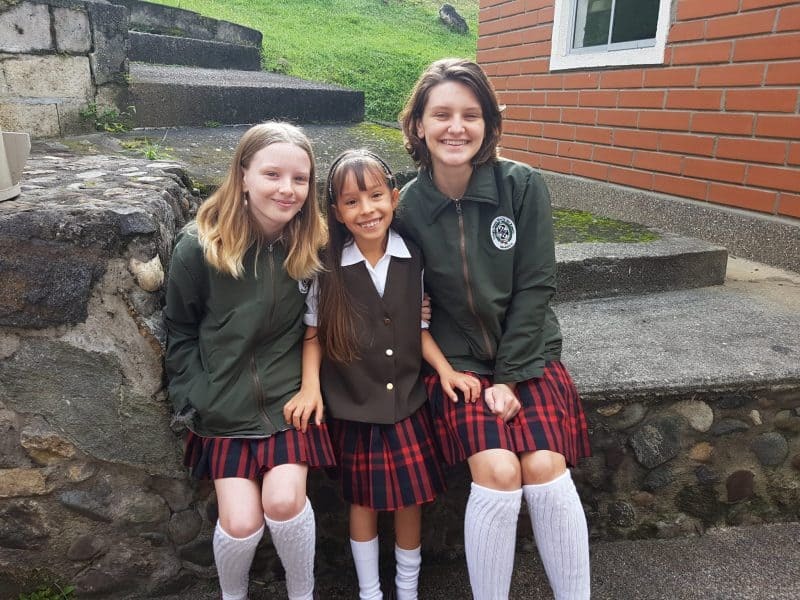 Haley’s teachers are referred to by their first name, Zoe calls hers “profe” (pronounced “pro-fay” and it’s short for “Professora” in Spanish which is “Professor” in English). 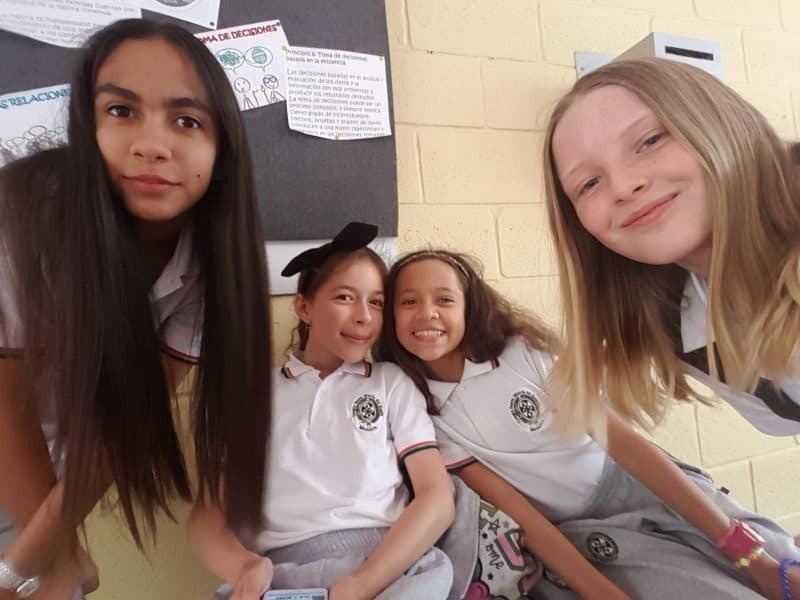 During the first day or two, the English teachers hovered around the girls for awhile until they realized that both girls were doing just fine with their Spanish. And each class has at least one kid who speaks English **really** well. But Haley and Zoe said most of the day was in Spanish. Even as they were telling us about the day, they kept using Spanish words. Both girls had teachers who made it a point to ask other kids to include them, speak slowly and clearly and be nice to them. The girls say they felt very welcomed. And if the teachers did not make a point of speaking slowly, other kids would call out “Profe you gotta talk slower for Haley”. Haley would’ve preferred to blend into the background a bit more but that’s not happening when you’re the only foreigner in a class of 18 girls. One of Zoe’s first days with her class had the class begging her to sing the Barbie Girl theme song in her best, Valley Girl American accent. Of course, she knew all the words so her classmates were amazed. Zoe got invited to a party involving full body neon paint and swimming. No mention of shots on a party bus so I’ll let her go. And lest you think that a private, all-girls Catholic school means there are only reserved and well-behaved girls? Nope. One of Haley’s classmates has a tattoo, which she got when she was 14. Zoe watched the horror movie “It” on one of the breaks. We aren’t in Kansas anymore, Toto. Zoe with some new friends. At least one Maria is in this photo. More selfies with Zoe. None from Haley: “We don’t do selfies, Mom”. I managed to get a pic of Haley and her new amiga Manuela, who seems like a super cool chick. It took a few days for the academics to kick in but by day 4 the schedule was set and the teachers began their normal rotation. Haley and Zoe both helped out in English class, correcting the profe’s spelling of “geese” Who knew it wasn’t spelled “gueese”? Haley, that’s who. Profe was so sure that was how it was spelled he made Haley prove it by looking it up. 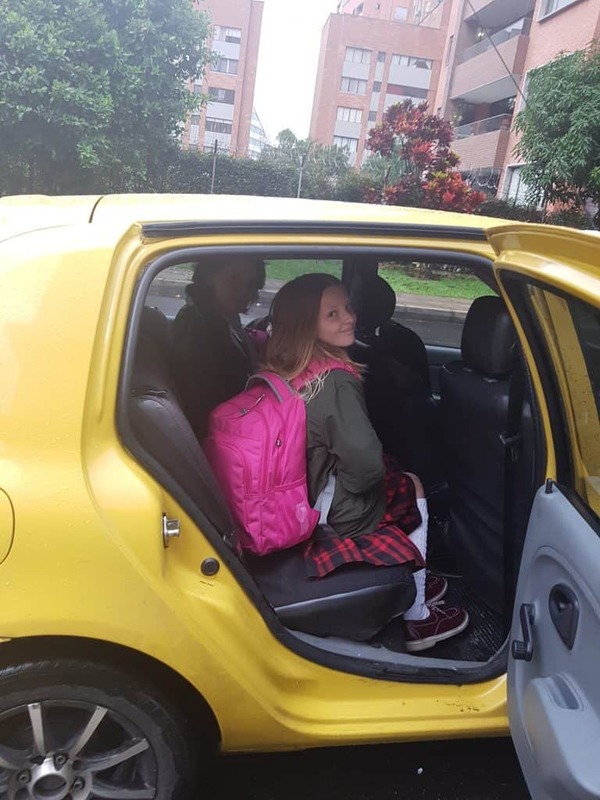 She also helped their English understanding of “finca” which directly translates to “farm” but Colombians use it to mean “vacation house”, which is where most Colombians spend their breaks from school. Haley was called on in math but didn’t know the translation so the teacher moved on. She redeemed herself later by drawing correct angles without the help of a protractor. She says she’s learning geometry but if ever she’s asked about it, she won’t know it unless someone asks her in Spanish. Zoe attended her first chemistry class and came home asking me to teach her chemistry, as she was pretty well lost. We will be printing out periodic tables in both English and Spanish and perhaps doing a little extra work on our elements at home! Math seems to be somewhat familiar to Zoe although they have different methods for solving the problems, and they use commas instead of decimal points which can be confusing to an American. So it will take some getting used to. Word problems in math give us some good vocabulary lessons. We now know how to say “wingspan” in Spanish. Haley reports being somewhat lost in Spanish Language class, but they’ll be reading some classics so we think Cliff Notes in English will come in handy fairly soon. Despite being audientes and not needing grades, both girls are doing as much work as possible, including homework. 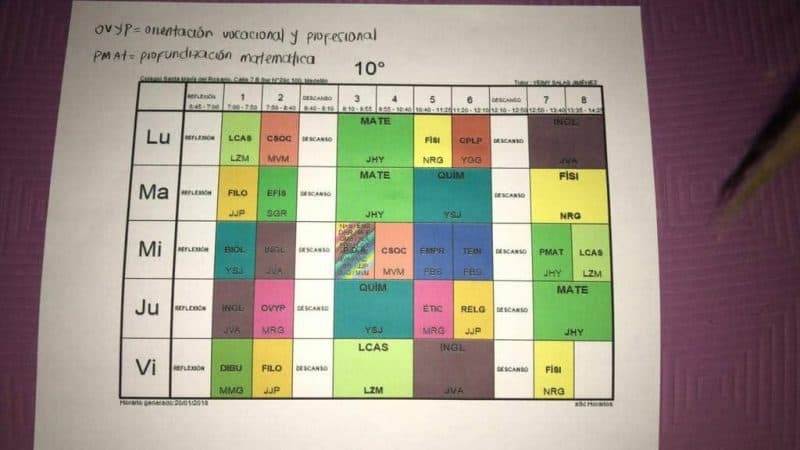 Thanks to the Decimo WhatsApp group, Haley got a copy of her schedule over the weekend. 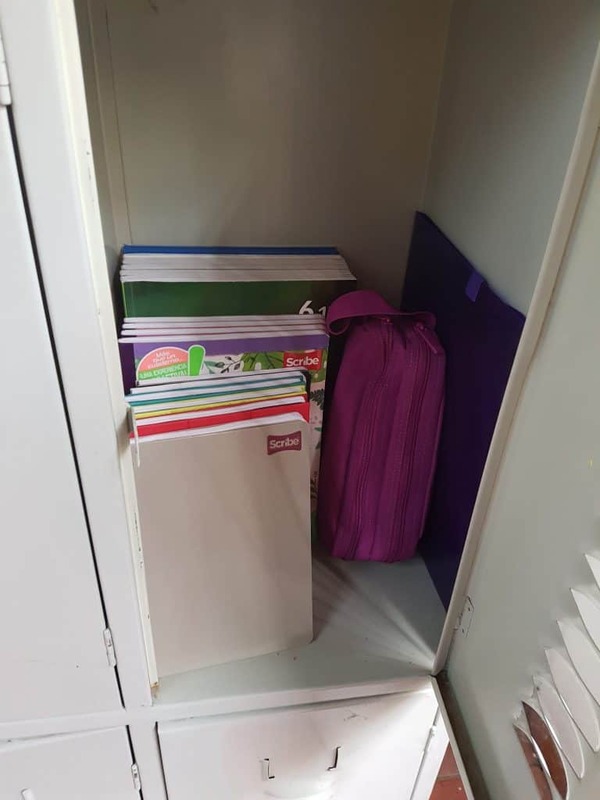 Zoe loves her locker, which is handy for leaving your homework in when you should bring it home and work on it. Zoe’s class had to take turns reading out loud for Spanish class. Zoe did well on her turn and received a round of applause. There are 23 girls in her class. School starting at 6:45 a.m. means we sleep as late as possible, which also means breakfast is minimal. Thankfully, after a few classes they have a 30 minute break and the cafeteria is open for the students. Food is cheap so instead of taking any lunch items, they just buy a lunch each day, which costs between $1 and $3 USD. So far Zoe loves the ham and cheese sandwich, Haley ordered breaded chicken for lunch and declared it amazing and I think both of them are sampling way too many items from the Tienda de Dulces – junk food store. 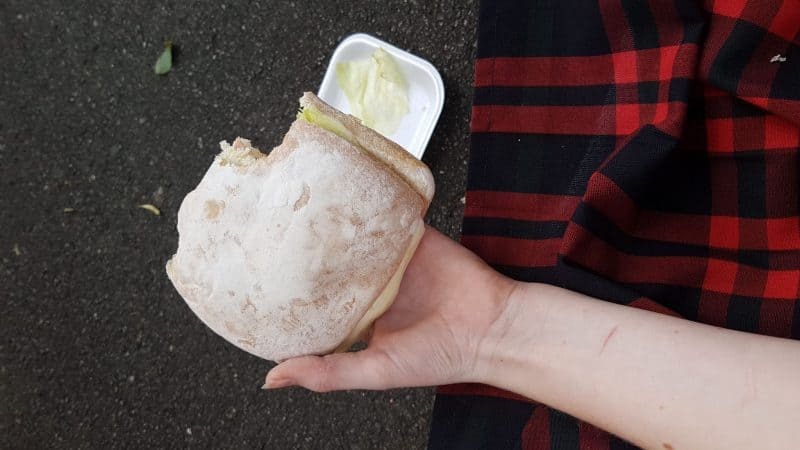 Fun fact: when Colombians eat in front of others they offer EVERYONE a bite of their food. Haley said she lost half her bag of M&Ms by doing this. Haley is having a little trouble with dozing off in 1st or 2nd period so she’s hoping to sneak in some caffeinated tea in what looks like a water bottle. Zoe’s new favorite lunch: a ham and cheese sandwich bigger than her hand. Cost: $1. Yep, I found my beloved Pilates, which is just a few blocks up the hill from here, so I even get in a workout and lots of “buenas dias” from the construction workers on my way. And if 4 days a week of Pilates is not enough, I have also found yoga, which should also keep me busy for the other days. We are adjusting to the new wake time, figuring out how to structure our day with eating, adjusting our laundry schedule to accommodate only 1 PE uniform and only 2 blouses, and still working out the bus transportation. We are settling in to the routine just in time to change it! We have a previously-scheduled trip to Mexico for two weeks to attend a summit of other Worldschooling families. The climate is a bit colder so the girls say they’ll be taking their PE uniforms. As long as the conference days don’t start at 6:45 a.m., I’m good.